It doesn't decompose, it deteriorates. Landscape cloth. I don't care what you hear about it, what you read, or what anybody says. Don't do it. Landscape cloth was the all time stupidest gardening decision I've ever made. I thought I could use it to conquer my wire grass. I thought I could eliminate it by smothering it out. I was lured by the so-called "guaranteed." I spent days laying the stuff out and pinning it down. I spent more days covering the entire area with wood chip mulch. The directions said 6 to 8 inches of their brand of rubber mulch, but I would never use that because it won't decompose. The rubber mulch should have been a red flag before I ever bought it. But it's lightweight! (Flimsy). It is porous to let rain in through! (And sunlight). By the end of the summer the wire grass was happily beginning to poke its way up on through it. By the following summer, the wiregrass had taken it over. Eventually it matted the landscape cloth to the ground. The only way to get it out was to dig it out. The "Guarantee"? Well, if you don't follow the directions to a "T" (i.e. apply those 6 inches of rubber mulch) any warranty is null and void. This spring Dan took the tiller to it so we could plant corn in that spot. What a mess. The wiregrass matted landscape cloth bound up the tiller and left squillions of bits and pieces of petroleum based landscape cloth all over the place. I'll probably be picking them up till the day I die. But at least the corn looks good. Your turn. Have you made a worst gardening mistake? I put "Fresh" wasted hay as mulch in my berry garden. I was picking grass from the fallen seeds in the hay out of the garden mulch forever. Leigh - That was my greatest mistake too. Yes, it did more or less kill the grass below the lemon trees, but in the openings round the lemon trees the weed growth was hectic. It also fell apart, and before it fell apart it harboured all sorts of different pests. I think it depends on the kind of "fabric" you use. We experienced the same thing with the cheaper "shiny" thinner kind. It just dissolved. I can't remember who the manufacturer is but we buy it at Sams Club in a huge roll. We lay it and cover with pine bark mulch. If you double layer the fabric, it holds up pretty good. All the weeds and grass we have are ONTOP of the fabric so it's pretty easy to pull. The Bermuda too. It's not perfect but what is? Worst mistake? Which year? I believe that this year's jewel is keeping our "front beds". These are really 45 degree slopes that nothing should be grown on to begin with. The chips are great, but they really need to be reapplied every two years to really get the good smother going. The animals are great, but let's face it: they don't eat everything you want, WHERE you want. I guess the key is not wanting beds. They are a pain in the drain and take so much work to look nice. At a certain acreage, a person just has to say, "no." OK, so when i was telling you about a month ago that i had bought 75m of weed mat to put down under the crushed rock to kill my Kikuyu, why wasn't anyone yelling at me saying "Don't Do It" !!!! I've only put down a little and I've lined my raised beds with them after having sprayed the grass. Its all going OK now but what im hearing is that i have pending doom im my future. This is not good new people! Worst mistake? Let me count the ways . . .
What comes to mind first is the year I mulched extensively with oat straw. Which had a gabillion oat seeds in it. It wasn't a garden out there. It was a field of oats. Carolyn, I hate to say it, but I've had that problem with straw mulch too. And it was mixed with bunny manure so I thought it would be great! I just established a firm bed of oat grass. I've never used uncomposted straw since. Dani, I'm sorry to hear that. I suppose some things we just have to learn the hard way. Barb, you're hitting on a subject I've been contemplating lately, beds. I know permanent raised beds is THE way to garden and landscape, but I have a heck of a time keeping them nice looking, especially the edges. The lawn mower can't reach bed boards and borders so they always look terribly messy. I suppose most folks use a weed eater before snapping photos for their blogs(?) I just can't see my way to doing that. And I agree about acreage. Keeping a dozen beds tidy looking is one thing, but I've got 30 beds in my vegetable garden alone, and then there's the herbs in the front yard. If one grows field crops, beds are totally out of the question. I haven't finalized my thoughts on this, but I'm coming to the same conclusion as you. Lynda, don't give up hope, yours may do well! Read Tami's comment. If those beds are deep enough you may conquer it. I think the bottom line is that gardening is work, no matter what approach we take! Mama Pea, that was my other worst gardening mistake! I had a beautiful garden of oat grass; what a headache. If that happened now, I'd either cut the oat grass for hay or harvest the oats for grain! Same mistake as you. I was still picking it out of the ground every year and unwrapping it from the tiller tines until we finally sold that house and move to another house... where the previous occupants used it on all their beds. For now I'm just suffering with it and pulling pieces out until we finish outside remodeling and then work on landscaping. Never again will I use that stuff though. I'm using card under my woodchip so it will judt decompose but I know I'll have to keep topping it up every year to smother the weeds.good job my brother is a tree surgeon! As for my worst mistake there are too many to mention but not getting weeds before they go to seed is right up there at the top of my list. We tried the landscape cloth as well, and it didn't work! What a weed bed we ended up with. Ed, I once lived in a place that used plastic instead of the landscape cloth. They covered the entire yard with it, piled with dirt and planted. The entire yard was enclosed in a privacy fence. It was lovely but they began to have drainage problems and eventually the slab foundation of their house cracked. The next door neighbors told us the previous owners started to have problems after they landscaped. (This was in Texas where it's either bone dry or a gully washer.) We would have torrential rains that the ground couldn't absorb and the fence would trap the water so that we had a huge flood in the back yard. What a disaster. We bought the house cheap as a government foreclosure, which also means "as is." Never could sell the house because of the foundation. Kev, weeds are the biggest battle, aren't they? I never seem to beat the seeds, but the perennial weeds win every year. Sandra, ooo. I had to chuckle but only because we've been there and done that! Sometimes I think we're our own worst enemy. Worst mistake, planting directly in the soil at this rental home when we first moved in. I was racing the clock to make sure we had time putting things in the ground for a good harvest. I didn't follow my instincts, instead we tilled up the ground and planted. Total waste of seed, time, and effort. I was so discouraged. My worst mistake is the same as yours. When we put in our very first garden beds we put woodchips between them. When the grass started to come up we put down two layers of landscaping cloth between beds (without removing the old chips) and put more chips on top. 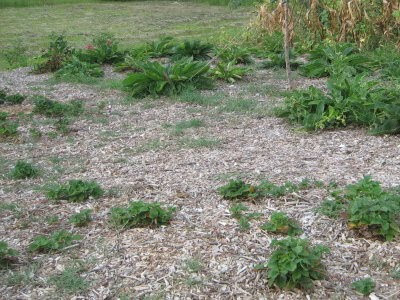 When those wood chips started to grow grass and other weeds I put more wood chips down. When those chips started to grow really healthy weeds we followed another bit of ill-fated advise and put old newspapers down. Along with a generous helping of still more wood chips. Fast forward about 8 years: The garden in that location is shaded out and all that is really, really, REALLY productive is the woodchip/newspaper/woodchip mulch we created. We decided to move the beds and reclaim the ground. As hard as it was to grub out the beds that were now buried in 6" of well-compacted mulch and salvage the good ones, scraping wheelbarrow load after load after load off the landscaping cloth, ripping it out in teeny-tiny bits with all the weed roots it now supported, and shoveling yet more loads of wood chip mulch to the compost pile was a task akin to hauling Virginia down to North Carolina in a the back of a 1973 Pinto station wagon. To make it all worse, a couple years later I figured out if I'd left what I now know to be the Hugel bed I'd created in place I'd have a number of quite profitable options for growing mushrooms and the like right there. As one of my USMC drill instructors used to tell us - "You privates may not be smart, but you're gonna be strong!" It would be shorter to list my non-mistakes with gardening...I look at every tiny success as a major miracle. You've reminded me of the time ages ago where I took the advice to "repurpose" old carpet strips in the garden, to keep cleared paths between garden rows. DISGUSTING. And it took a couple of years to get it all out of there, and taken to the dump (at a price, of course). It's one of those things where you just cannot imagine what you were thinking! Learning is hit and miss, through experience. One reason I like reading blogs is that I can benefit from the experiences of others. I won't use any landscape cloth. We learned from a long time Ozark gardener a smart cheap tip for keeping weeds out. She put down cardboard, newspapers and heavy bundled magazines where she wanted her garden in the fall. Over winter the paper kept the weeds out of the garden. You just pick up the bundle/paper where you wanted to grow stuff. Then put down 2-3 year old hay as a mulch. The seeds will not sprout from the hay that is old. No weeds. It might not look great (stacks of paper and mags around the ground, but it works and is great for composting over time- no black $$ plastic.We have copied her plan for 3 years in a row and wow it works. Will never buy the black plastic again. Good Luck and happy gardening. To grow the best runner grass in the garden, just put down landscape fabric (or what we term in Australia, weed mat) We made that particular discovery early in our gardening adventures, in another house. My worst mistake in this garden was probably pulling weeds. It just made the soil great for the next infestation. I learned quickly in our wet season, not to pull weeds. Mow them instead! This one simple change in tactic, meant we prevented further soil erosion, and actually started adding nutrients back into the soil. The only time I will pull weeds now, is if I'm feeding my guinea pigs or if a seedling I've planted, is being smothered. And then I will only pull weeds around the plant, not the whole area. My worst gardening mistake, turned out to be my best gardening tactic. Serenity, more votes against landscape cloth! Sandy, some things just can't be rushed and we've learned that weather can be a pressure prompter too. Ah, for lessons learned. Renee, oh no. Manure is truly bad for that and I have trouble with compost too. I don't think it gets evenly hot enough to kill all the weed seeds. I agree with how discouraging it is. Nancy, oh no! I would have cried! Mark, seems like all our stories about the landscape cloth are the same. Sounds like you had a real mess to deal with. Quinn, I hate to say it, but I might have done the same thing! 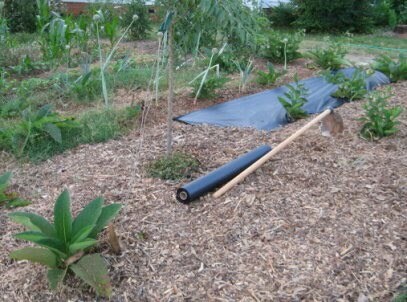 In the end, cardboard and mulch seem to be the best solution for weeds. Harry, very true, on both counts. Experience is the best teacher and we learn a lot from the experiences of others! Nancy, another count against landscape cloth. Chris, +1 for mowing! That's my main way to control weeds in garden paths (because I can't get cardboard down everywhere). If it can be done before it goes to seed, it really helps. I bag my clippings and give them to the chickens. Freshly scraped up goat pen straw as mulch = lotsa weeds. Still and all, the vigorous growth of the veggies has probably outweighed the weeding which, although it looked dire, took me a mere 15 minutes for the worst bed. Without a doubt, landscape cloth is mine too. I won't ever use that stuff again. Wire grass is tough to get rid of- it has even grown through two layers of tarp and the bottom of a completely filled above ground pool. The only way I've found to almost completely get rid of it is either to dig up the area and then mulch heavily (like 6-8 inches), or to solarize the area with heavy black plastic for a couple of seasons and *then* dig it up. Ugh. I am still using a roll of Geotextile which we bought back in 1999, which is still going strong in places :) Sorry :). I don't know the make, just that it was heavy duty landscape fabric. it is VERY thick and close woven - I suspect that is the secret of its success. Mint - a variety of unusual mints as a pretty and useful (!) border around a bit of the veg patch. That is one of my bigger mistakes. Still paying for that one! I've never had that issue with biodegradeable landscape cloth. I've used the non deteriorating kind as well. We just lift it when we're done with it. Cardboard works, but not always available. The worst problem we've had with landscape cloth is that the toads like to hide under the edges, so you have to be careful where you step. Straw though - I can't imagine how much grain wastage there is in combine harvesting because I'm sure I could have fed half the country block with the grain which grows after mulching with straw. It seems to be best if you can leave it to start rotting in the bale for a year - but you need space for that.